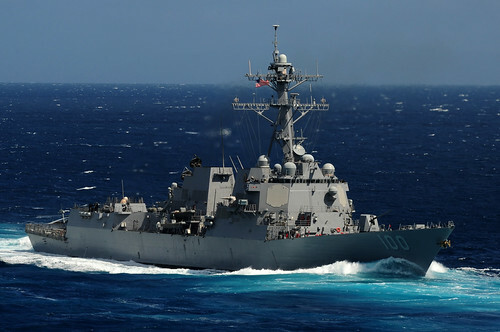 USS Kidd (DDG 100) file photo. INDIAN OCEAN - U.S. Navy assets continue to search for Malaysia Airlines flight MH370 as the Arleigh Burke-class destroyer USS Kidd (DDG 100) expands its patrol area from the northwest entrance of the Strait of Malacca into the Indian Ocean and Andaman Sea, March 16. Upon receiving the updated tasking, Kidd and the two embarked MH-60R helicopters immediately transited to the new search area to continue the search and rescue mission. Kidd is covering more than 300 square miles of water space every four hours and is meticulously investigating anything that may be evidence associated with aircraft debris. "Our helicopters are an extension of the ship's capabilities and provide us with the best chance of finding airplane debris," said Lt.j.g. Eric Bachtel of Phoenix, Az, the ship's Combat Information Center Officer. "With extra watch standers in place, we are able to comb through any debris spotted from the ship or the aircraft and if needed retrieve the objects via grappling hook, small boats, or with our Search and Rescue swimmers deployed from the ship or helicopters." Kidd searches more than 1500 square miles of ocean each day, investigating any possible debris that may be linked to the airliner's crash. Kidd continues to support the overall Malaysian government search effort by sharing information and investigating possible leads. The Kidd crew remains persistent and hopeful that they will find indications as to the possible disappearance site of Malaysia Airlines Flight MH370 in order to shed some light on this tragedy.